Neo-conceptualist, Jenny Holzer, once said that it was women who were doing the most challenging art. This was undoubtedly during the heyday of the burgeoning feminist art movement and among others she was probably thinking of her compatriot, Barbara Kruger, who was also creating text based billboards. “Their work is much more extreme than men’s,” Holzer declared. New Zealand artists, since the seminal work of Colin McCahon, have had a love affair with text. McCahon had to have words and eventually, in his spiritual quest, words with their moral and transcendent bite were all he wanted and exclusively dealt with. Peter Robinson’s earlier politically oriented paintings and sculptures incorporated text that were raw and comically edgy. Simon Denny’s All You Need Is Data is a more recent exemplar of language as art. Have the men caught up? 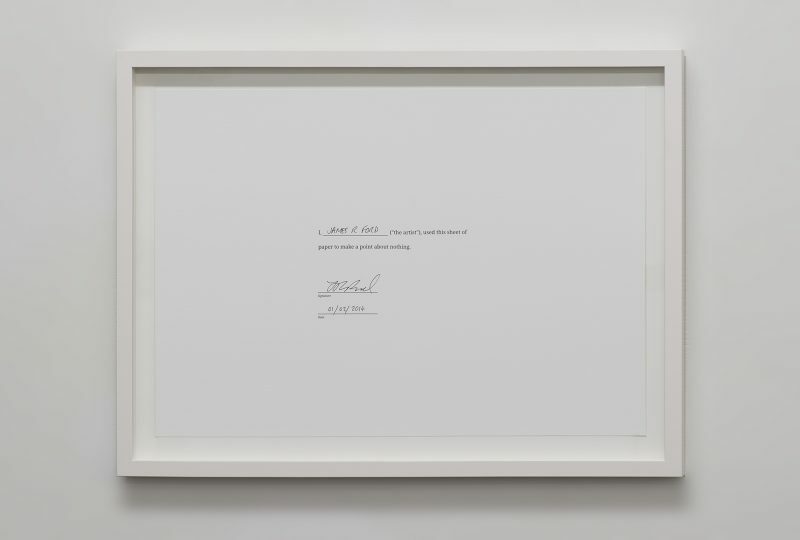 When one comes to the work of neo-conceptual artist, James R Ford, one can confidently say that they have. But there has come about a subtle shift when dealing with the nature of words and text Ford conjures with. We have moved beyond preoccupation with spiritual or political matters as such. Stepping back a little, the focus now is on something more primary; on the nature of language itself and the realisation that it shapes our reality. The linguistic turn in philosophy saw Wittgenstein pronounce that language had its limits and if we defied them we would all be talking nonsense. He went on to famously declare that “What we cannot speak about we must pass over in silence.” A couple of decades later he memorably changed his mind. Now there were no limits. Or more correctly, the limits were imposed by a particular community or sect who prescribed their own meaning to words. Things became contextual and culturally relative. It was as if he’d just remembered what Alice said in Alice and Wonderland – “If I had a world of my own, everything would be nonsense”. Epistemological anarchy on the borders of nihilism is where we seem to find ourselves at the moment, courtesy of the French deconstructionists and this is the world Ford explores in his art with various Dadaist proclivities. Part Goon Show, several parts Monty Python, Ford approaches the legacy left us by the twentieth century with the same sardonic spirit. He looks out from a twenty first century world and sees similar patterns of absurdity the Dadaist observed during and after World War One, which had prompted their nihilist response. Text appears in many of Ford’s works. It’s as if he is testing the limits of language, seeing what it can do when put under stress, judging whether it holds and sustains logic or collapses under pressure, sabotaging meaning, credibility or empirical sense. A typical example is Belief Minus Doubt (2018), a billboard type format, painted on canvas in black and white, recalling elements of Barbara Kruger’s textual design motifs. Another is a sand blasted glass mirror, from 2015, inscribed with the words, “Things Other People Think”. The gridded and pyramid compositional format draws on the rhetorical language of abstraction to provide gravitas, but the text itself, with its satiric tone, undermines such formal seriousness. Something Not Very Meaningful (2014), using the same design formula but with household paint on paper, reveals the cynicism Ford is toying with. It’s like an artist watching paint dry, which is the title of an actual performance piece of his which involves such a literal exercise. Ford, like other neo-conceptualists, use, reuse and recalibrate the methods of the Dadaist and later Fluxus while adding a few of their own. Performance was one of them. Schrodinger’s Cat in the Hat is Ford’s 2012 video presentation (8 min 22 seconds) of a magician staging a ‘demonstration’ of the thought experiment associated with the nature of quantum mechanics. The cats in question are two fluffy toys alternatively appearing out of a top hat after the word abracadabra is repeatedly intoned. But the ‘dead’ kitten is presented as a bloodied and mangled animal, evoking a whole other range of emotional and mental responses well beyond the simply scientific one. A second video, The Enigma of Being (2015), presents the existential conundrum via a 3 minutes 34 second film of a house fly trapped inside, buzzing against a closed window, its escape thwarted, unable to see that the window adjacent is open. Such ‘meaning of life’ explorations, humorously observed, are again reflected in a kinetic sculpture, an altered readymade entitled Road to Nowhere (2013). Comprised of a pull-along toy attached to a motorised treadmill, such a quirky juxtaposition recalls the pointless and repetitive efforts of the classical figure, Sisyphus, condemned to eternally re-enact his senseless task, a narrative used by Albert Camus to reflect on the snared and absurd nature of modern existence. This idea is later revisited, using another altered readymade, a tumble dryer complete with iconic image of a yellow happy face (modified from the smiley face button created by advertising executive, Harvey R Ball in 1963) filling the round window. Entitled An Absurd Hero (2018), this FHD digital video spins the ubiquitous beam on an ‘eternally’ continuous loop, reminding us that Sisyphus, reconciled to the irrational, has somehow managed to wrest a positive from the futility. But in this case, because of the inane cartoon face, perhaps a somewhat hollow victory is being suggested. Sentenced to meaninglessness, drolly inverted, is captured in a screen printed cotton tote bag, from 2017, with the title, “Condemned to Meaning” inscribed across it. One is damned either which way. The 2018 sculpture, Look Here, builds on a similar contested duality where we are invited, by an illuminated arrow, to look inside a wooden box through a peep ‘hole’, only to have our raised expectations thwarted when we discover that the hole is simply a trompe l’oeil creation. These binary constructs are repeatedly engaged with in comical ways by Ford to unpick, subvert and generally deconstruct the worth and stability of their meaning, whether it is language or the matter of universal human predicament that is under scrutiny. His alternatively lit red and blue neon words, Something or Something Else (2015), is an ingenious example, while his laugh out loud performance piece, Waterfall (2013), shrewdly operates on multiple levels as metaphor for both linguistic and socially ritualistic conundrums. This take us well beyond Holzer’s truisms and banalities. And it also takes us beyond “it’s the thought that counts” notion of conceptualism itself, because, as every honest viewer knows, it is more than just the thought that matters; it is, as they say, all in the delivery. And in a world where so much conceptual art is dead boring, Ford, with his wit, panache and mischievous intelligent practice, avoids that pitfall. He delivers.